We’d love your help. Let us know what’s wrong with this preview of Darkness Descends by Peter Arvo. A group of powerful royal blooded teenagers are about to experien Once there were many kingdoms of myth and legend, but six stood apart from the rest. They may have lost their origins, but they still possessed their elemental abilities of creation as well as destruction. Their rule was about to be threatened by an unseen group, who have waited patiently to make their move. To ask other readers questions about Darkness Descends, please sign up. This book is intended for a younger audience- not sure if children would be able to follow some of the strategic war talk or should read about so much death, tragedy and conniving characters, but young teenagers should definitely be cool with this read. Through tragic events the heirs and heiresses of different kingdoms end up together initially to find help for one of the kingdoms in trouble.. well, under fire actually. Their quest ends up having a bigger purpose for the good of all the kingdoms This book is intended for a younger audience- not sure if children would be able to follow some of the strategic war talk or should read about so much death, tragedy and conniving characters, but young teenagers should definitely be cool with this read. Through tragic events the heirs and heiresses of different kingdoms end up together initially to find help for one of the kingdoms in trouble.. well, under fire actually. Their quest ends up having a bigger purpose for the good of all the kingdoms. I don't want to say more and spoiler the story, you understand I'm sure. Needless to say at this point, however, that of course there are power hungry Lords involved in the background wanting to steer the kingdom(s) down a path beneficial to the Lords themselves. Mostly though in this book you'll read about the adventure and journey on how each of the royal teenager is being met, what they're like and how they fit into the group with their unique power. What I liked: The idea! The whole idea is definitely cool, I like how the elements are used to create the looks/characteristics and powers for each kingdom and their respective royals. A lot of thought had been put into creating all the kingdoms and all the characters are different which shows author's imagination is working full speed. Also- very good effort on Lauren's part- writing a book at 14 is a great thing to do! I am sure her ideas and writing will only improve over time. I’m going to level with you, I requested to review this book for a couple reason. Firstly I liked the cover and the plot behind the book, who doesn’t love a bit of fantasy where people have powers. The second reason and also the main reason behind me wanting to review the book is I loved the story behind it.. I loved the fact Lauren came up with the idea and with the help of her father Peter has helped it come to fruition. I always love to see parents support their children. I loved the story, th I’m going to level with you, I requested to review this book for a couple reason. Firstly I liked the cover and the plot behind the book, who doesn’t love a bit of fantasy where people have powers. The second reason and also the main reason behind me wanting to review the book is I loved the story behind it.. I loved the fact Lauren came up with the idea and with the help of her father Peter has helped it come to fruition. I always love to see parents support their children. I loved the story, the idea those with royal blood have elemental powers was a nice idea. I particularly liked the idea each kingdom had their own powers and these powers can be used in different ways or even combined. The plot itself is pretty straight forward, Hawten sets out on his mission to get help for his kingdom and in the process is meets the teenage members of other royal households who join him. It was a fun read, although something like this wouldn’t happen in real life I did think the authors managed to get the rebellious and adventurous sides of teenagers across nicely. The story is a coming of age tale based on fantasy, these young boys and girls are out to find themselves and learn about their powers as well as help Hawten. My overall impression of the book is that it is well planned out and very interesting to read, the only two things that could be improved for me were the chapter length and the amount of detail thrown in the story. Some of the chapters were around 50 – 60 minutes in length and I just felt this was a little too long for a YA book. This is an action-packed adventure. It will appeal to preteens and teens, as well as to adults who enjoy the fantasy genre. The main characters are a group of teenagers with magical abilities and royal blood. The story ends with a cliffhanger which will leave you anxiously waiting for the next book in this series. The fact that the author is a teenager makes this an even more amazing debut work. She has a talent that is definitely worth watching. ** I received a copy of this book in exchange for This is an action-packed adventure. It will appeal to preteens and teens, as well as to adults who enjoy the fantasy genre. The main characters are a group of teenagers with magical abilities and royal blood. This book was written by a young teen and co-authored by her father, and as such, deserves to be commended. A lot of adults can't even do what this young woman has done. But, I fear it was published prematurely. There are fundamentals of writing missing or incorrect in this piece. Overuse of adjectives and adverbs, repetition of the same pieces of information mere sentences apart, overuse of the same word in close proximity. Additionally, the prose is wordy (particularly when describing physical attributes) sometimes using four or five descriptors together to describe one attribute (normally hair!). Also, the physical attributes are listed like a shopping list of hair attributes, these things can be shown to the reader in better ways. Happily, all of these issues can be rectified by a decent editor. What killed the story for me, in addition to the above mentioned issues, was the juvenile tone and style of the book. This unfortunately means it's a lost cause for me. This does not mean that the book may not be suitable for younger audiences. A word of caution though, other reviews have talked about some of the themes, including a lot of death in the opening chapters, so if you intend to give this to a young reader, read it yourself first. I do not wish to deter Lauren and her father from writing, but would strongly suggest employing the services of an experienced editor for this and any future work. I am also impressed, by the fact, the book This book was a wonderful read, beautifully illustrated, with a lot of twists and even a cliff hanger ending. I am recently retired and decided to get either a science fiction, or fantasy book, that looked interesting to read in the evenings. I decided upon Elemental Kindoms, even though this book was probably more geared toward the younger audience, I enjoyed it very much and am looking forward to getting and reading the next installment in the series. This fantasy novel, that debuts a new series, targets an older child / young teen audience though I wouldn't recommend it for either. The main characters are all magic-wielding 14-16 y.o. royals that overwhelming act privileged, spoiled and snotty if not psychopathic. Their world is not unlike the Holy Roman Empire, divided into a multitude of small kingdoms with a larger pecking order. Six of the kingdoms stand out for having historic royal families that wield elemental magic. 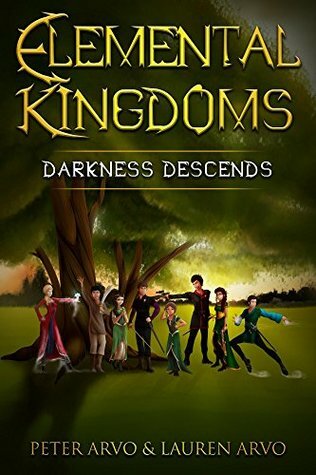 [ie Kingdoms of F This fantasy novel, that debuts a new series, targets an older child / young teen audience though I wouldn't recommend it for either. The main characters are all magic-wielding 14-16 y.o. royals that overwhelming act privileged, spoiled and snotty if not psychopathic. Their world is not unlike the Holy Roman Empire, divided into a multitude of small kingdoms with a larger pecking order. Six of the kingdoms stand out for having historic royal families that wield elemental magic. [ie Kingdoms of Fire, Ice, Air, Water, Earth and Electricity.] 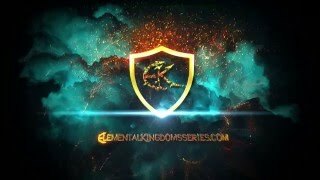 One major miss is in the lack of exploring how the elemental kingdoms culturally differ from each other and the non-elemental kingdoms. Only the Ice Nation seems to truly have a unique view on the world. These young royals lose family members along the course of the tale. However, the emotional toll is barely scratched as most of the ill-adjusted teens seem not to retain empathy or even sadness beyond a few minutes. This in itself could be an interesting stance if I thought the character lapses and myopia were intentional. What is clear, is the direction the series is taking since nothing gets resolved in the first book. Mainly, the teens find each other as the goal of this novel. The larger set-up that shows non-elemental people revolting against the elementals and wishing elemental magic gone remains to be resolved. This opposing POV, sympathetic to the rebel cause, is not given any depth. This tale is strictly for the 1%. I received a free copy of this in exchange for an honest review. This was definitely my kind of book and after finding out it was a collaboration between 14 year old Lauren and her dad, I was even more determined to read. I liked how the royal family were all introduced together, and then you saw Arden and Hawten's close brotherly relationship as they left the meeting. The action started quite early on, which I enjoyed. I felt like I had been reading about the characters for years! I couldn't shak I received a free copy of this in exchange for an honest review. This was definitely my kind of book and after finding out it was a collaboration between 14 year old Lauren and her dad, I was even more determined to read. The action started quite early on, which I enjoyed. I felt like I had been reading about the characters for years! I couldn't shake the feeling that Arden was going to be a bit of a tyrant and I was intrigued by where this would go. Ahmu was a much lighter character and I enjoyed the light humour that he bought to the plot. I was unsure of Arthur's role, and this continued once he had been left behind. I understood his father's relevance, but was unsure about Arthur's. I was intrigued by Hope and Clover's ancestry, but felt the conclusion could have been drawn out a bit more. I most definitely did not like Soltun. Treachery is afoot in the realm and the possessors of the elemental powers must seek each other out, join forces to develop their powers and work towards discovering their common enemy. This quest/fantasy novel is the first in a series of books exploring themes of friendship, collaboration and bravery. The story dives right into the action, while managing to avoid descriptions of extreme violence (a positive thing in a book designed for young people). The book is written by a father-daughter team (nice to see) and will appeal to tweens and young teens (10-15 years). My only complaint about the book is that it is written in present tense. I find that this pulls me out of the narrative, disrupting the flow of my reading. This is a personal dislike of mine (except when I am reading plays and scripts which have to be in present tense) and may not be of concern to other readers. This book definitely has potential, but personally I do not believe this book was for me. It aimed towards a younger audience. I'm only 16, but I feel like I would enjoyed this a lot more when I was still in middle school. I had to DNF this book unfortunately. The idea for this novel is great! I love the concept! I just wasn't able to enjoy it like I hoped. If you're a young teen I would definitely suggest that you try reading this because there is a big chance you would really enjoy this book a This book definitely has potential, but personally I do not believe this book was for me. It aimed towards a younger audience. I'm only 16, but I feel like I would enjoyed this a lot more when I was still in middle school. I had to DNF this book unfortunately. The idea for this novel is great! I love the concept! I just wasn't able to enjoy it like I hoped. If you're a young teen I would definitely suggest that you try reading this because there is a big chance you would really enjoy this book a lot more than I did. Lauren is a home schooled teenager who loves reading and writing about ancient myths and legends. She also enjoys participating in the online role-playing com At eleven years old, Lauren Arvo started working out the details to a suspenseful fantasy action novel. Three years later, in 2014, and with the assistance of her dad, Peter Arvo, that first manuscript became the basis for Elemental Kingdoms.